SHORTLISTED FOR THE PARAGRAPHE HUGH MACLENNAN PRIZE FOR FICTION 2016. In Canada in 1991, ten-year-old Marie and her mother invite a guest into their home: a young woman who has fled China in the aftermath of the Tiananmen Square protests. Her name is Ai-Ming. As her relationship with Marie deepens, Ai-Ming tells the story of her family in revolutionary China, from the crowded teahouses in the first days of Chairman Mao's ascent to the Shanghai Conservatory in the 1960s and the events leading to the Beijing demonstrations of 1989. It is a history of revolutionary idealism, music, and silence, in which three musicians, the shy and brilliant composer Sparrow, the violin prodigy Zhuli, and the enigmatic pianist Kai struggle during China's relentless Cultural Revolution to remain loyal to one another and to the music they have devoted their lives to. Forced to re-imagine their artistic and private selves, their fates reverberate through the years, with deep and lasting consequences for Ai-Ming - and for Marie. Written with exquisite intimacy, wit and moral complexity, Do Not Say We Have Nothing magnificently brings to life one of the most significant political regimes of the 20th century and its traumatic legacy, which still resonates for a new generation. It is a gripping evocation of the persuasive power of revolution and its effects on personal and national identity, and an unforgettable meditation on China today. 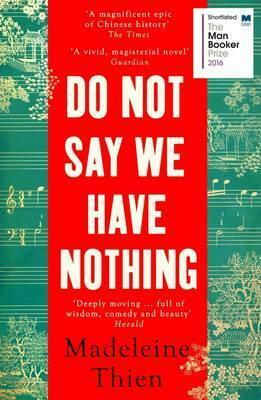 Madeleine Thien's novel Do Not Say We Have Nothing was shortlisted for the Man Booker Prize 2016 and won the Scotiabank Giller Prize 2016 and the Governor General's Award 2016. She is also the author of the story collection Simple Recipes (2001) and the novels Certainty (2006) and Dogs at the Perimeter (Granta, 2012), which was shortlisted for Berlin's 2014 International Literature Award and won the Frankfurt Book Fair's 2015 LiBeraturpreis. Her books and stories have been translated into 23 languages. The daughter of Malaysian-Chinese immigrants to Canada, she lives in Montreal.